In our Batman: Arkham Origins walkthrough we will show you the way through all the main and side quests of the game. We’ll give you useful tips and tricks that help you to play. In addition, we’ll show the locations of hidden objects, such as Enigma's data packs. Our walkthrough begin with the main quest, then lead you through the side quests and we will also show you all the other hidden items and their locations in Gotham City. Note: The complete solution to Batman: Arkham Origins is not yet complete, but is subject to regular updates. To help you get started in Batman's latest adventuree, we offer you some tips and tricks that help you during the game. This includes information about the combat system, tips about the hidden objects and the general gameplay. 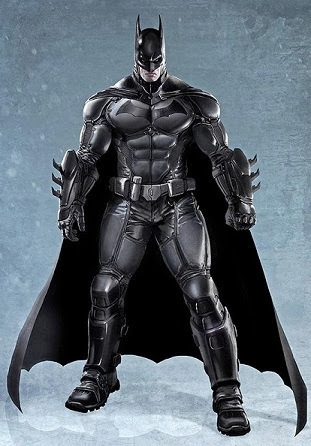 In Batman: Arkham Origins you will encounter generally two types of combat. First, there is open battle. In most cases you will fight against a variety of enemies. Note that your opponents have different abilities. Player of the first two Batman games knows the procedure. Police with a shield can only attack from above. Opponent with a stun gun only from behind. It explains to you at first with each new opponent as you defeat them. Mark you the shortcuts. Basically Counter is a good way to defeat opponents. Dropping bright blue flashes on the minds of your opponents on their leads from a counterattack. On the other hand, fit with red flashes. These can not be countered. With the second option, fight with yout opponents by sneaking. In such cases it is advisable to first check the environment. Best with your detective vision, it will give you an overview of how many enemies are in the room. It is worth getting snipers. These are usually located on elevated points. If your turn-maneuver and even go wrong you will discover, it is always useful with the Batclaw to pull up immediately to change positions. Confused your enemies and they lose your track. Throughout the city and in most buildings you will find Enigma data packs. However, every package is not visible. Incase if you pass a package and see no way to get it into your hands, just continue playing the main missions. You get additional equipment with the aid of their respective brings you packages in the course of the game. After the introduction you will find yourself at the beginning of the prison again. The first mission in this case represents the tutorial and generally explains your fight through different transitions and step towards the end of Killer Croc. This is best done where you drugged him with the help of your shell and thus makes incapacitating. Then place the first blow. Killer Croc fights leap back up and running on different fuel tanks, while a helicopter brings more opponents. At this point it is very important that you respond quickly and pull your Batarang. In order for you to explode the fuel bottle and cause him more damage. If the bottle explodes, you will face Killer Croc few more times until he throws a gas bottle to you again. Watch for the Dodge, if you see red flashes above his head because of a hit he inflicts a lot of damage. Kill the opponent with this mission. The first radio tower resembles a second extended tutorial and is also self-explanatory. Your free the criminals that keep the hostages. In order not to endanger the hostages use the first silent hunter tactics. At the end you get the detective's point of view explained and clarified by the death of an employee. You get it directly and the display evidence must be analyzed. All except the last. These can be found by rewinding the recorded crime requires. The Capture Card is dropped into a ventilation shaft. Both the ventilation shaft and the card can be seen even before the reconstruction of the crime. You still have to see this through completely, so you can open the tray. After finding the map you can open the door using the cryptographic sequencer and continue to climb the tower to the top. Above you will find a PC, its data is also decoded by the sequencer. Now start a video conference with Enigma and you get the order to a side mission. Then you can leave the radio tower and have the first fast travel points unlocked. You can now move freely in Gotham City. As soon as you enter into the city you have to find the arms dealer of the penguin. After a small scuffle you manage to push him into the corner and get information about the penguin. Your next task is to find radios and disable them. Try to eliminating the enemies located there. However, before you disable the radios you have to tackle a noise signal. The door to the interference signal is electronically locked, remove the fuse her where you direct your steerable Batarang through the hole in the fence right up and then "follow" him to let the fuse box. Then you can open and you can remove the noise signal by decoding the computer door. Then you go to the district of "amusements". There you will find the first radio. It looks like a kind of computer with connected satellite dishes, keep your eyes open or use your detective vision here. The next radio can be found in the industrial area. The enemies here are quite difficult because they are armed with heavy machine guns. Try with smoke bombs to eliminate penguin men in order to get to the radio. Finally you get to the base of the penguin. It is located in the freighter "Final Offer". Before you go to the ship, there are snipers to tackle. It is recommended to turn off the sniper on the tower first. For this purpose, you sneak behind the tower and go up. Then shimmy forward and take the enemy unnoticed. Then you can fly with your Batman kick on the other side and get rid of the second sniper. The remaining opponents turn off their best isolated and unnoticed. Watch out that you do not leave the ship during the whole time. If you pass this, you have to start again. In the ship you are fighting with a series of opponents, and then penetrate through several transitions deeper into the belly of the freighter. At the very beginning you can see on the right side in the water an enigma-data package. This, however, you can not collect at this stage of the game. Later returns to this point, to reap it with the help of adhesive grenades. If you keep running past it through the gears, you encounter sometime on a small canal. Pull the raft on the other side with the Batclaw to ride over. Then go down to the adjacent aisle. You end up in a room where you see the personal "arena" of the penguin. However, the door to the fighting compartment is closed. You find your way in which you shimmy up and in this way find an alternative route to the arena. Fit the vapor, this can be quickly pulled yourself to some life points. Next up you come into a room where you will find another data pack, which is, however, protected by steam. Also here you can return later to collect the package with the help of adhesive grenades. Through a ventilation shaft and other passages you finally make it to the arena and after you have encountered with Electrocutioner, more enemies will come to the arena, you have to defeat them. Then continue through the corridors of the ship. You are moving on to their lands projection and walls in a high room in which it apparently does not continue. In the room, you’ll see the text "Caution 3" on the great wall. Now go only once to the opposite wall and slide under it through to find another data pack. Then return again. Enable now the detective's point of view, you see the wall right next to you is fragile and can easily be torn with the Explosive. This gets you into the next room where you fight her on various projections of the way up. Next you'll find a door that can be opened later in the mission behind it there is also a data pack. Jump from this projection to the left and shimmy further up. You come to another room with a closed door at the end. Here you can get hold of a further data pack. Look up a ring that can attach to your Batclaw and can tear down part of the ceiling. Above you can find the package that you can achieve with the help of the steerable Batarang, similar to the radio tower before. Look at the door to the left. There you will find a grid through which you reach the next room. The door of this is protected by a computer; you simply decrypt the password and then come to the next room until you reach a lift. Walk to the top and look for Tracey, and use the computer to gather more information. Then jumps through the glass behind you, there you will find a further data pack, which you reach through the active switch to the dollar sign. Then go through the door to the theater. After you've opened the door you will surprised by opponents only once. Do this and go into the next room. In this there are many enemies. Bring your opponent out gradually and confused them by leap located at the top of the protrusion. In this room there is another data pack. There is a grid on the floor. Open it, and then move through the narrow shaft, after a while you have to step out of the bay, to enter a room where the package is located. For the main mission, you continue through the door and meet there for the first time on the penguin. However, you can hardly ask him here you will encounter another opponent Deathstroke. Who wants to reach 100 percent of the Achievements, make sure not to miss a counter attack in the battle, and then there's an extra success. With their help, you will also find another data pack in this room. Also you want to go into the penguin’s room. The door is closed; however, you decide to pursue the notice of villains and make you on the Lacey Towers. You climbed to the Lacey Tower and then use your Cryptographic Sequencer to listen to the radio calls from the police. Then switched from the guards in front of the building and penetrate over the balcony into the building. Get to the crime scene quickly and with the help of the scanner proof of the crime. To assign the various DNA evidence, you need data from the main computer of the GCPD. The police station Located in the district "Burnley". To enter the building, destroy the first opponent silently. After you enter the building, you stand in front of a closed door with the words "Keep Locked". The wall to the right of it is easy to blow up. If you happen to pass, you come to an elevator. This automatically brings you to the next level, once again the door is closed. The way out is through a lattice on the top of the wall. You open it with your Batclaw, crawling through the shaft to the next room. Here it proceeds, you have stretched a rope with your steerable Batclaw. As a result, you get further up. There, you come across a door which opens only after decryption with the cryptographic sequencer. Behind it is the interrogation room. You get more useful information there. In the next room you need to climb again. On your way you will see another data pack which you can reach later. In the next room there are again many police officers are equipped with small arms. So you should go unnoticed. This makes it with the help of many different projections. But be careful when they discover they begin to shoot off the projections. Once you have done all your opponents, you can watch the room again in peace. There is an office in which there is another data pack. To follow the main mission further, cross the room and open the door also backed by a computer. When you are nearing your final destination, you will be hampered by a new door, the code can not crack, as an interfering signal transfer. You remember that there is a switch for the corresponding noise in the evidence room of the district you have to get there. The path leads through a door or could not open your target before in the infirmary. In the station there is a brittle wall, which leads to an elevator shaft. On the wall "Elevator" and you can blast them with the help of Explosives. Then you pass through a corridor and pull you through the Batclaw up on a lead. You use the steerable Batclaw and positioned a rope above you to pull you up. In the next room there is another data pack, which is more difficult to achieve. Stay on the rope taut through the steerable Batclaw sit and throw a Batarang through the electricity before you, guiding it back to the small air vent on the side, thus destroying the fuse box. Observe the ability to slow down the steerable Baterang any time and the ability to apply it with a push of a button, otherwise it is almost impossible to reach the fuse box. For the main mission you go through the chute and find yourself on the other side of the breaker. On the way back before you close the door that opens again using the interrupter and the cryptographic sequencer. You find yourself again within a large prison room and sit against some opponents to defend. On the way you will see some rooms in flames as well as a room blocked by hot steam. Here you return later for another mission. Finally, you end up back at the original door with the breaker under brecht the interference signal and hack the electronic lock. Get more information from Barbara and flee through a grid on the wall. After eliminating some guards and the hacking of another door lock, finally the door is open and you can make your way into the sewers. The way into the sewers using a Gullideckels within the city, shimmy down and jumps in the first room on the underground channel or break the wall on the right side, after you have rid of the opponents you go into a high room in which you seek your way up. In the room go down the water using a button, now, you open a valve using the Batclaw and direct the steam from the pipe around, so this is no longer get in your way. Go part of the way back up to the ledge and looking at the middle of the room. On the left side there is a holder for the steerable Batclaw. Used this and shimmy further up. On the next platform you will find a computer. Hack this and it opens below a transition. Jump down and move through the corridor and the door at the end. In one room you can find on the right side of a tube, which you can open it. With the detective discovered her sight behind a data pack. You sit across from an elevator. Desselbigen jumps onto the platform, and the opponent switches activate by pressing the button. The elevator goes up to another room where you expect more opponents. After the encounter you can log into the GCPD system and get you the desired data. There you will also learn that your next order for Gotham Merchants Bank leads. You leave the sewers through a door and into a side room. There you will find on the right side behind bars a data package that you can achieve later, just as it is with the path on your left that is blocked by steam. This way you will in a later mission contest. A ladder leads you straight to the top. There, you will receive the order to another side mission. You come out from the back yard, where you crack the electronic lock at the garage. The password is "hat shop". The Gotham Merchants Bank can be found in "The Bowery". On the roof there are two destructible surfaces. One of them, next to the door that does not open, leading into the building. Search the opening room, a trap door, through this you can enter to the bank. For the next door you need to remove the circuit breaker to eliminate the interfering signal above the door. Then you can crack the electronic lock with the password "OPEN YOU". You enter from above the main hall of the bank. There is a locked door on the other side. Just before the door you come through a grid on the floor into a pit. Change in the first-person point of view and you find another data pack. Then you go through the ventilation shaft to the left of the next room door. Then you meet the Joker. In the next sequence you find yourself once again in the big room of the bank. Here you can lose sight of the enemy by jumping from edge to edge. After you've done that, you leave the building through the, previously locked, door. The steel mill can be found in the district of "industrial area". However, before you enter, you have to destroy the enemy. Be careful here, because you wait for snipers and other armed opponents. In the building you turn left and go through the door that is not locked with a code. You come across another door through which you can not pass, however, because it is protected by armed men on the other side. Climb through the ventilation duct into the next room and done your enemies. If you activated the detective vision, you discovered a wall next to the ventilation duct that goes beyond him. Behind there is another enigma-data package. Then return to the previous room and bring the code for the locked door in the input space. Disable the automatic guns and go to the locked door then use the code obtained. The door lock can only be decrypted with the password "DRY". Then turn left up the stairs and you stand in a darker room, where a new short staircase. This is high and you move to the left into an even darker room. There is on the left at the bottom of a ventilation shaft that leads you to another Enigma packet. After you collected, go right through the door and destroy another group of enemies. Then at gate some more. An opponent of them is called "Joker's enforcer." Once you have defeated him the other will evade. It is relatively slow and caught in his attacks at times his own comrades. On the left side, seen from the front door, you will find another password-protected door. The code "CONNECT" it opens the door and enter sewers. You will find another data pack but leave it for the time being, later returned and used the adhesive grenade to make you way for the data pack. After encounter with the crane, use the rope to climb up and slide down. In this way you tear a wall and leads to another Enigma packet. Climb through the previously torn from you with the truck wall. On the right side you will see a further data packet, which you can collect later in the game. Then take the elevator and then get out of the elevator and defeat the next opponent. Then open the next door with the password: "DRUG". You'll find yourself in a large drug lab again. Get rid of your opponents immediately, otherwise they will slash you with shotguns. After the battle, you find Black Mask in his slightly elevated office. There you met Copperhead, they injected a poison. To leave Alfred develop an antidote, it scans the room for clues. As you staying Copperhead and you have to fight against them. Complete all of the emerging Copperheads to add it as the real end damage. This tries to harm you, lightning fast attacks and dodging will help. If you have done Copperhead, you get the antidote and then return. Look for the Electrocutioner to find out where the Joker resides. This can be located on the top of the Pioneers City Bridge. Follow the meter information to the Royal Hotel. You come into the building through the garage, which is located to the right of the main entrance. Defeat the enemies and step inside. On the right side you will find a piece of data that you can get later in the game. Go into the garage to the left and then jump down the tab. Defeat the enemy and go left through the password-protected door. Give "ROYAL HOTEL” head to the next room. There you operat the switch with the batarangs to turn off the power. Then use the steerable Batclaw a rope to move up. Open the garage door and start the main generator. Then use the elevator to go up. At the top, look to the right you will find a data pack. Here you step into the hotel lobby. Defeat all the enemies, move unnoticed and avoid open war. At the end you check the grid on the ground and you’ll find another pack there. Then go to the front desk and open the door with the password "ICHSEH". After you have looked at the video transmission, keep out the cargo crane in the middle of the room. Jump on it and activate it with your newly acquired shock gloves. At the top, you climb out of the building and shimmy to the next tower. Once there, you go through the passage and find yourself in front of a locked gate again. Directly on the wall next to it there is a switch that can be activated by the power in your gloves so that the gate opens and gives a narrow passage free. Defeat the enemies behind you. At the end of the room there is another door that can be opened from the circuit board. Behind it there is another data packet. Then go through the door into the wash chamber and passes through the ventilation shaft on the right side of the elevator shaft. Jump from the first elevator and from there, to the Second. Activate this to drive up there you shimmy through the shaft to the next level and stand against other opponents. Then, speak with the hotel staff. On the left you will find another door that you can open with your electronic gloves. Follow the next gear from there look out the window. You can steer with the Batclaw stretch a rope to the next tower of the hotel and shimmy. Once in the next tower, follow the first corridor until you come to a point where you can no longer go on, then an automatic gun fires at you. Disrupt this with your breaker. The goal behind it can be opened with the electric gloves. Slip through and you are in a high ventilation duct where you have to climb up. Go to your right with the Batclaw high and shimmy along the wall to the next platform. Go further up and then clamp with the steerable Batclaw another rope. At the top there is a passage through which you can not go due to hot steam. Later return, if you have the adhesive grenades. To progress in the mission you disabled using the button in the big room fan and then you move past it further up. Then crawl there. Open through the shaft and with the Batclaw behind the tube, the steam that has been blocking the way will be redirected, then go to the next platform up. In the next corridor you move through a narrow passage to the right and come to a platform. From this you can move from the Batclaw up there you will find another data packet. For the normal way you turn in the hallway outside the small passage, but continue through the door to the next floor. There slip through under the gate and defeat the enemy. Behind there is a door to the Joker. Go through and then jump down the shaft. Defeat the enemies you meet, because only then you can open the door. However, before you go through the door, 1.5 minutes is set for the next task. Run into the room and press the first two switches left and right with your Batarang. Then stretch a rope to the opening brackets, with the steerable Batclaw. Shimmy up and jump onto the platform opposite. Slip after blasting through the resulting hole and eventually disable the switch use the password "KNOCK KNOCK". After you've done that, you can jump back to the ground again. Follow the path further into the face of a clown. There you must find your Batarang steerable control so that it flies out through the one eye and purely flies through the other back, so that you will meet the fuse box. If the fuse box is unchecked, open a flap over you, pass by you to the top. Next is a game that you play against Joker. Mark you, the order of the luminous heads and then shoot the balloons in the right order with your Batarang. First, light heads (numbered from left to right) in the sequence "1342", the second time in the order 4312. Once you have won the game the door opens to the next room. There jump into the "arena" where there are more opponents. Once you have destroyed them, you can shimmy up the balcony and you activate the Jack. Attached to its nose rope and climb further up to another balcony and go through the door there. It gives you more opponents, going from there up to a gate that block your way. You return and open the grille at the bottom and climb to the bay. Look closely inside of it, then you discover another data pack. Crawling through the shaft and jump on the other side out to do other adversaries. Go through the next door and you find on the left a wall. Then shimmy through the opening to the next level and you rappel up to the window. When you open the next door, there is a fuse with the password "HAPPY NEW" to disarm and then to jump and run away through a window, then you automatically on a helicopter to take you to the next platform with the next enemies. Defeat them and take a lead in the pool area. Once there, you'll encounter more enemies you eliminate them silently then use the elevator in the middle of the room. The password for this is "PLANSCHEREI". Go to the top and imagine Bane. This Venom used to be even stronger for his attacks. You jump to the best attacking once over him and then stunned him with the ultra-stunning. Only then you can harm him. Once you have incapacitated, followed by a cutscene and a game scene in their slips in the head by the Joker. Done with him and opponents follow the visible transitions. In the Batcave, you plug into a Kleberanate. Then get down to the morgue GCPDs, in the borough of Burnley. The entrance can be found in the vicinity of the police station. Go through the gate and then run down the hall. If you encounter water slide over it and go through the next door. Then turn you in the direction of the corridor that is blocked by steam. Eliminate the vapor through the adhesive grenade and continue. You now find yourself in a part of the sewer system, which you know already by a previous mission. Take the path opposite of you and climb up the ladder. The trapdoor on the circuit has a lock that can be opened with the password "DEAD HOUSE". Arrived at the morgue, you see on the ground a plate underneath this, a further data pack. After you've collected it, scan the body and leave the sewer by the known path. For Banes neighborhood you travel to the other end of the city in a tunnel. First, tackle the sniper and then the remaining enemies and then move. In the room on the right side you will find a ventilation duct, open it and climb up and then move. Opposite side behind bars, there is another data pack, you can reach that later - then return back. Then slide down and tackle the enemy below you, continue by blasting a crumbling wall. Then go with the adhesive grenade at a raft across the Channel. Pull up with Batclaw. When you open the next door, you expect quite a few of your adversary. Defeat the enemies and get through the door in Banes headquarters. After you pass through another door, you reach into a slightly larger space. Right there is an area with several screens on, head in and looks more right to the top. There is a grid open it and taken the data pack. Look in the room and then continue through the transition to the next. There, you will gain new information. Then get down on the way back through the corridor already familiar with. Listen to Firefly radio. Then get down on the way to Gotham Pioneers Bridg, Firefly to stop. Go near to the bridge, then the Batwing start a diversion. Meanwhile, addiction to a side entrance of the bridge to Commissioner Gordon. Take only the enemy at the door and then go into the building. Under the stairs at the entrance you will find a Data pack. You talk with Gordon, the elevator door chop right next to his office. The password is: "COAST GUARD". Shimmy in the shaft upwards. Then open the gate to the wall above you and crawl into the bay. Climb the ladder and then turn the portable generator with the help of the shock gloves. This can drive up an elevator, which opens another way. Before you move on, look up from the generator to the right. There is a switch that can be activated with the Batarang. The switch causes a grid open behind there is another data pack, this grid you reach but only if you followed the normal way. Go through the resulting path, then you will find yourself opposite a reachable platform due to hot steam is not accessible, however. Adhered to the adhesive grenades, the pipes and then shimmy up and up until you come to top. To the left you will find the data pack already mentioned. Collect the best one with the Batclaw. Then jump over to the steel beam and shimmy to the right until the next platform. Then you climb up the ladder until you get to the next door. Do not go through the door, instead revolve around you. You can shimmy up with the Batclaw to another platform, and find in this way a further data packet. Then go through the door, you see behind iron bars a data pack that you can reach later. Jumps to the section about it and go into the ventilation shaft. Then you come into a large room where you have to movie unnoticed. Careful with the projection in the middle of the room, it will explode after a short time, when you Step into it. interrogate recent opponents and defuse the bomb. You need to enter three passwords in succession: "Pyromaniac", "EXPLOSIVE" and "FLAMMABLE". You have each only 15 to 30 seconds. Then put yourself through the door on the right and follow the passage to the elevator. Activate and go to the top. Jump over the elevator or further up the ladder and activate the elevator with electricity again. Thus it creates you a platform that you can jump through the wall behind the elevator. Settled there more enemies and bind Brandon. You see a further data pack behind bars, which you can collect later. Climb the ladder and then open the valve to the other side. Then climb up the next ladder and into another large room. Take both opponents. Then you can take other opponents easily in the room. Searche for the interview with the hostages to a door at the "Control Room". Behind there is a room where you activate the elevator to free the hostages. Climb to the top of the train and defuse the bomb with the following passwords: "INFLAMMEN", "ACCELERATOR" and "nitroglycerin". Again, you have a few seconds. Before you leave the room through the open door on, head below the bottom grid to find another Enigma pack. Leave the room and then move to the door with the switch. Enable this by using your shock gloves until the bars on the door and you can enter. But hurry up so that when you're out of a long time to let the grid closes again. Turn to the room to the left and try to destroy the fragile wall. It is an explosion under you and you land on a steel piers of the bridge. Shimmy to the BatClaw visible to the next wagon and from there to the next slide steel beams. Then stretched a rope with the steerable Batclaw. The anchor point to something you find on the left. Then you abseil from it and jump to the next steel beam. Your slide further on the roof of the train. The opponents, who are now all follow snipers trying to do silently as possible. Then head over to the next door and go through. Defeat all other enemies inside and defuse the bomb with the passwords. "BURN", "smoldering" and "FIRE DEVIL". Then go back to the way you familiar with. Hold on to the wagon and move. Used the Explosives and you find yourself back at the point where you are previously broken. Then return to the room where the hostages were staying before. But be careful, because there are again enemies that you have to do as quietly as possible. Inside the train you will find another data pack. Then move through the main fire door. Next, you go through the small door on the right. You will receive another data pack when you activate with your current shock gloves and steer your Batarang fly right up through the gaps. Backward through the stream and then go back to the fuse box. Return and then take the other door that open with shock gloves. Move up there on the next ledge and jump start with (!) on the other side. There you shimmy along the slope until it finally pulls you to the bridge. Eliminate all enemies there and compete against Firefly. Use your adhesive grenades and your Baterang to defeat. Then return to your Batcave and repairs the computer to track Alfred. First, destroy all enemies in the courtyard. Then search the courtyard. You will find a manhole cover. Climb down there and make you on the way through the sewers to go to jail. Look around in the sewer until you come to a point where the gear no longer continues. Use the explosive gel to destroy the obstacle. Fall all the way down and then shimmy to the Batclaw back up. Then go down the hall and make you the next hill a path with the steerable Batclaw. Now you come into a room, the floor should not be touched because it is covered with electrified water. Give you a way to the rope of the steerable Batclaw in the room crossways. Destroy the wall with the Explosive gel and then jump to the other side. There you can turn off the power. With the help of adhesive grenade you can create a raft to get across the Channel. At the next platform, you turn to the left. Pressed the button there, a power source is on the other side of the room. Throw a Batarang through the current and let it land on the fuse box. Then, the water rises and you create with your adhesive grenade a raft that will take you to the opposite wall. Here uses the Explosive gel and rise through the wall. Next you have to get to pave, on the way you have to block the steam with your grenade. Then re-creates "glue grenades boat" and let the current carry you, block valves using adhesive grenades. When you reach the corner, glued the three valves right above you and shimmy up. Then destroy your opponent and activate the electrical box with the shock gloves. Then a lift is moving down and you climb to the top. Then move through the door into the next room. Here you see two ventilation ducts. Take one as both lead to a large room where you have to destroy enemy. Then pass to the Panopticum. Defeat all the enemies and go left up the stairs, down the hallway and then back down the next stairs. In the next room will encounter some opponents. Those who want to achieve success 50 combo punches, this should try here. Then move through the next door, down the hallway to the next door on the right. Go through and defeat all enemies. In the next room there is Bane, fight against him, you can actually ignore the other enemies. Bane uses against any cover offered to you. If you end up with Bane in the next room, use open attacks nothing more. Hide yourselves and attack him in this way to harm him. Try the hidden attack near electric door, and then you can cause more damage. If he finds you, quickly try to find a hiding place, but be careful, he looks into the ventilation ducts. Defeat him in the next passage to the door and then shimmy to the top. Jump from there to the left and defeat the other enemies. Then you move through the last door of the main mission.